Easy running feels good at a 7:50-8 min pace; tempos are more like 6:45-7 pace, and long runs I typically aim for 7:15-30 pace. To run a sub 3 marathon, become a running coach, and get back to Boston in 2019! 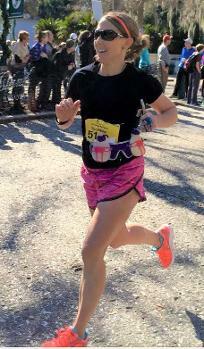 Describe your best marathon memory.- Turning left on Boylston Street when running the Boston Marathon! I've never been happier to see a finish line in my life! You can’t beat that crowd support, especially at the end! Tell us your best pacing experience. Hopefully I’ll have a good one after i pace Kiawah Marathon in 6 weeks!! Why should someone run in your pace group? Because I like to talk (haha) and can be a complete goofball. What better person than someone to make you laugh and smile while tacking on the miles?! Plus, I have unofficial experience in pacing friends in previous races. Any tips for runners about to join your group? Get ready for a fun race! This is supposed to be enjoyable, so let's have a good time while crushing goals!